For shots of the beginning of courtship, it was too late. Beginning and mid of April you can observe this dainty bird of prey courting over the dunes of Norderney. Then the fascinating, steep upward flights of the males, their loops and swoops from a great height can be banned on the image. But even so, it was obvious that the females were visibly impressed of the tireless forays of the males. The male brings the prey to his mate – but not the nest. Instead the handing-over is done in a spectacular manner in the air. On the morning of the 1st of may, after (the first?) meal, I could see and photograph a copula of a pair. Harriers prepare their nest in low bushes or on the ground. The females are solely responsible for the brood. Meanwhile, the male hunts for himself, his partner and the young in the dunes and grassland areas of the island. Identified on the images taken as prey were both songbirds, probably Meadow Pipits (Anthus pratensis), and voles. The handing-over of the prey, when the male flies over the dunes and then lets the prey fall on the up-rising females, which is loudly calling is certainly one of the most spectacular situations that you can experience doing Harrier Photography. But the dogfight between a male of the Northern Harrier and a Carrion Crow (Corvus corone), which lasted about a quarter of an hour or the expulsion of a younger individual (probably in the 2nd year) by the female of the pair were very impressive, too. When photographing it was obvious to see what kind of breeding and hunting habitat the Northern Harriers has chosen. The observation of courting and breeding Northern Harriers is rare in Germany, because the large-scale destruction of habitat have a very negative impact on the population of this species of harrier. 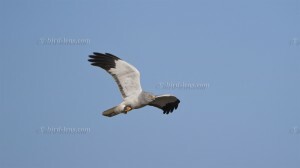 Previously, the Northern Harrier was a typical breeding bird of heath and moor throughout Germany. During the draining of the marshes and reclamation of the heath together with an intensification of agriculture, the harriers lost their habitat on the mainland. Beginning in the 1970s, the Harrier was able to find new breeding grounds on the islands in the Wadden Sea. An additional reason with positive impact was the fact, that the islands in the Wadden Sea are largely (mammal) predator-free. Until the late 1990s, the breeding population of Northern Harriers grew on the East Frisian Islands. From 1998, this trend came to a halt and, since 2004, a significant decrease of broods has been recorded. As M. Schröder et. al. already mentioned in an article about the hunting grounds of Norhtern Harriers and Marsh Harriers on the East Frisian Islands (Jagdhabitat von Kornweihen und Rohrweihen auf den Ostfriesichen Inseln) in “Die Vogelwelt” 131-231 – 238 (2010) the Northern Harrier prefers- at least in the month of May – the (wet) sand dunes and therefore this is the area that is called Grosses Duenental (Great Dune Valley) where the Harriers could be observed very well. Further east, I could not be seen the Harrier. Perhaps these areas are too wide and open and do not provide enough food. Today, the Harrier is one of the most endangered species of breeding birds in Germany and is on the red list of endangered species. The breeding population in Germany is currently at a maximum of 60 Harrier pairs. More than half of them are breeding on the East Frisian Islands in the national park “Wadden Sea”. Good reason to make the trip and photograph this beautiful raptor. The Gallery Shows the results! But also otherwise these early mornings during a fantastic, sunny week (but very cold) were a real pleasure – even from the point of ornithology. In addition to the shots of the harriers, it was possible to see and photograph birds like Willow Warbler (Phylloscopus trochilus), , Northern Wheatear (Oenanthe oenanthe), European Stonechat (Saxicola rubicola)and even Ring Ouzel (Turdus torquatus). Good contributions to the bird-lens portfolio. The East Frisian Islands are extremely valuable from the conservation point of view as their habitat hosts for a variety of breeding and migratory birds – some of them highly endangered species. Of the german Red List species many species occur in high numbers on the East Frisian Islands. For four species namely Northern Pintail, Anas acuta, Northern Harrier, Circus cyaneus, Little Tern, Sterna albifrons, and Short-eared Owl, Asio flammeus, the German East Frisian Islands are the most important breeding area. To cope with the growing demand for top shots of the rarer species of the Palearctic Bird-Lens is keen to enrich the range of pictures of birds you can find in the western palearctic. Trips to remote places like the Macin Mountains in Romania far away or to tourist spots like the island of Norderney (also) to capture images of rare birds of western palearctic were very successful. The nice images you find in the gallery are only a first impression, what you will find in the gallery in the “Pictures Shop” very soon. Just give me a message, if I could serve you with an image needed before the new pictures are online.